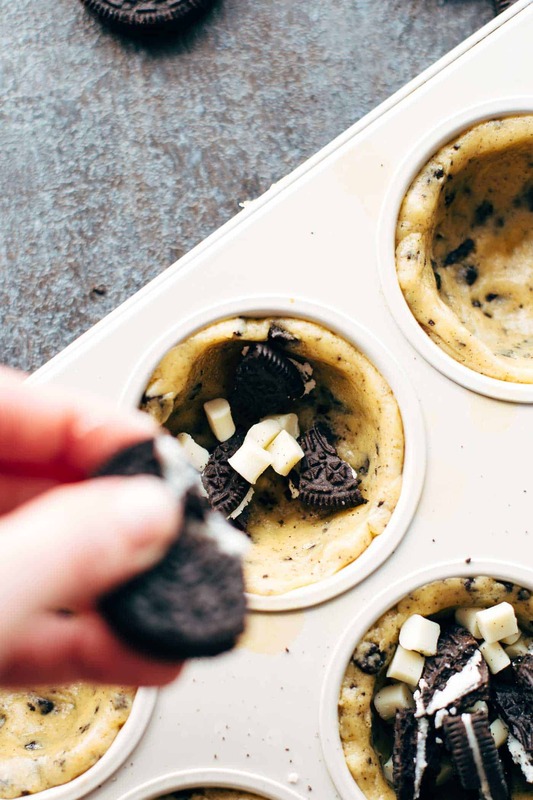 Easiest ever Oreo Cookie Cups made from scratch. No dough chilling. 9 ingredients and in just 25 minutes prepared and baked. 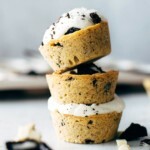 Oreo Cookie Cups – Cookies! Cookies! Cream! This is my 100th post. Yeay. I’m looking back on almost 11 months of blogging. Like every blogger, I’ve learned a lot in my first year. When I look at my first ever post, these Halloween Vanilla Cake Pops, it makes me smile because of the photography. Uuhh, but it also reminds me that there are just 4 1/2 weeks left until my favorite holiday is. HALLOWEEEEN! I posted different kinds of recipes throughout the last year, and it took time to find myself where I want to go with my blog. In which niche should I settle myself? This was the hardest question because, you know, when you start out you have so many ideas in your head and are not really sure on which to focus on. Because I know now what you really really love, it’s so much easier for me to find the right recipes for you. 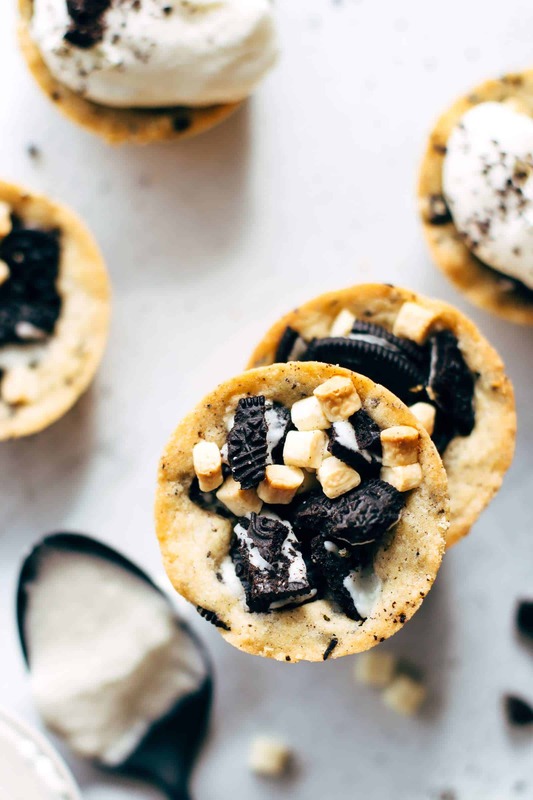 You are going to love these Oreo Cookie Cups! Cookie dough with chopped Oreos. Filled up with crushed Oreos and white chocolate chips. Top it with whipped cream and crushed Oreos again. Attention again. Did you read this? Super chewy cookie dough with chopped Oreos inside formed to cups. OK, amazing so far. Let’s go on. Then fill up with crushed Oreos and white chocolate chips. WHAT? So freakin’ delicious. I topped mine with whipped cream, and it was beyond delicious. You could fold the Oreos and chocolate chips into the dough and roll cookies out of it. The baking temperature and time would be the same. But come on! 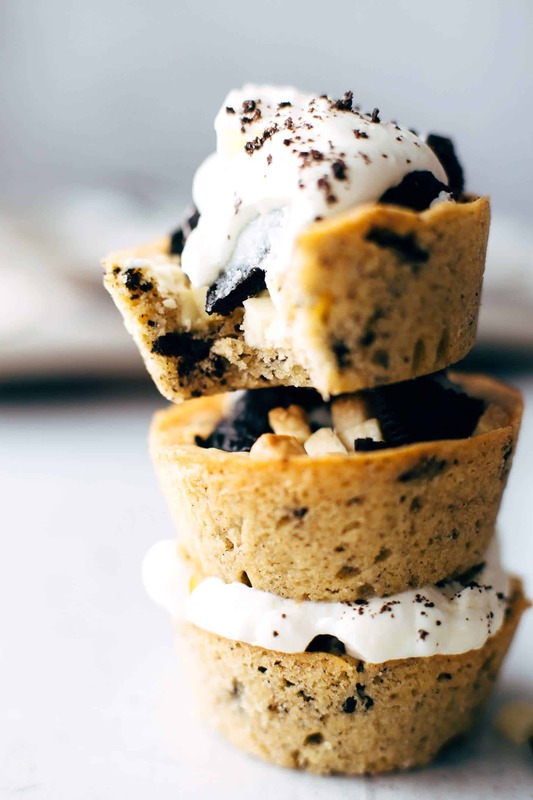 Which better excuse could you have to eat whipped cream to an Oreo and white chocolate stuffed cookie cup? I never top cookies with whipped cream, but I do top my cookie c-u-p-s with whipped cream. Game changer. I’m serious, make cookie cups instead of cookies. The white chocolate fits perfectly to the Oreos. But you could use semi-sweet, or milk chocolate as well if desired. Or go with chocolate Oreos as well and skip the chocolate. However, you like it. I did use chocolate chips because I didn’t want to have melted chocolate in the cups. If you want to have melted chocolate in the cups, use chopped chocolate bars instead. done in 25 minutes including preparing and baking. super chewy and filled with Oreos and white chocolate. 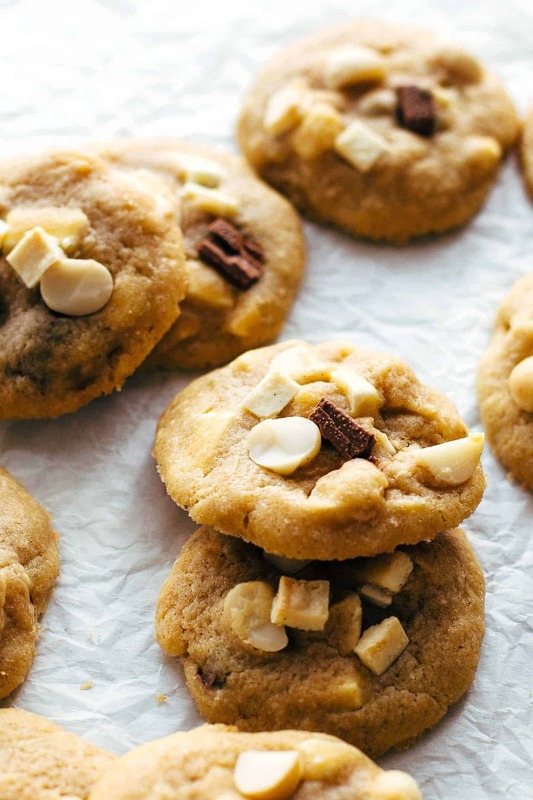 the best excuse ever to eat cookies with whipped cream. Thank you for your love! You are awesome! 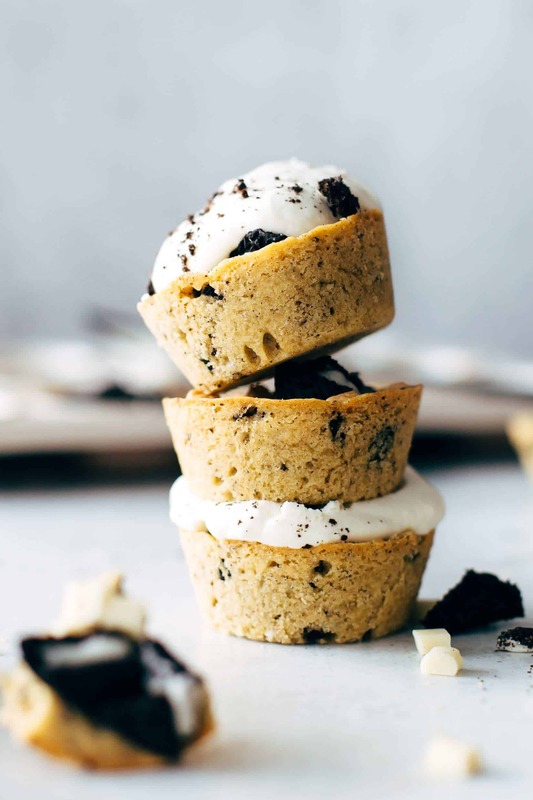 If you make this Oreo Cookie Cups recipe leave a comment, rate it and tag a photo #alsothecrumbsplease on Instagram! Would love to see your snap! You may also like Snickers Pie Cups, Chocolate Macadamia Cookies, S’mores Cookies, Marbled Pumpkin Cake with Maple Frosting, or click here to see all things sweet. Preheat oven to 350°F (175°C). Chop 4 Oreo cookies into very small chunks. Set aside. Microwave butter until 2/3 melted. Then stir until completely liquid. Transfer together with the sugar to a large mixing bowl and stir with a handheld or stand mixer fitted with a paddle attachment on medium speed just until combined for about 1 minute. Add egg and vanilla* and mix for about 30 seconds just until combined. Add flour, baking powder, and salt and mix just until combined. Don’t overmix at any step or your cookie cups will dry out. Fold in chopped Oreo cookies. 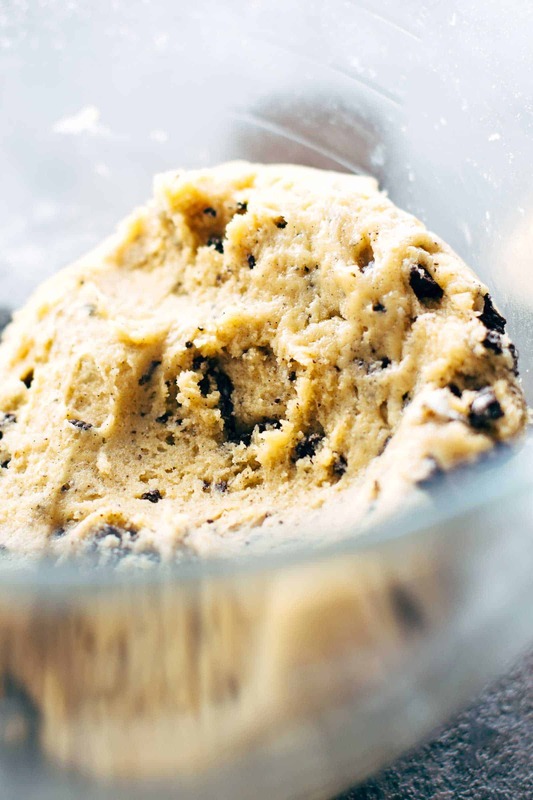 Divide cookie dough equally and transfer to a 12 cup muffin pan. Press dough evenly with your fingers into the cups. 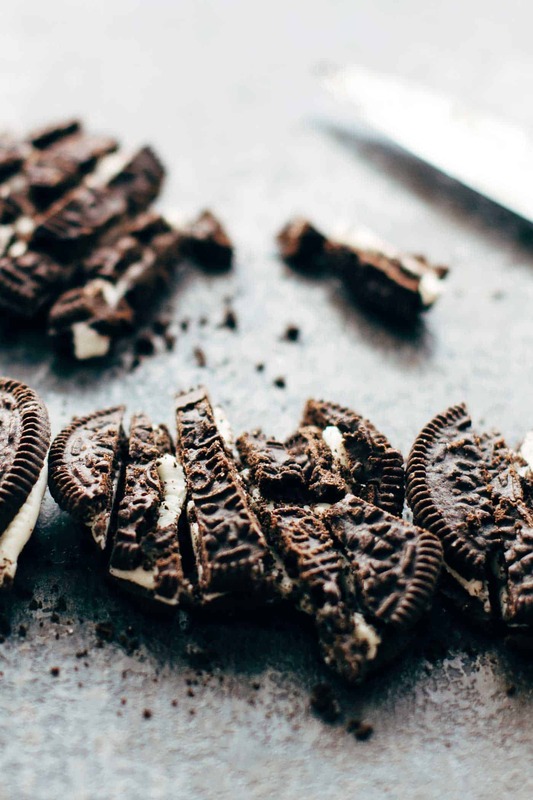 Crush remaining Oreos with your fingers into irregular sized pieces and fill them together with the white chocolate into the cookie cups. Bake them for about 10-12 minutes. (I bake mine for 11 minutes.) Remove from oven when they look matt, pale and puffed. Let cool to room temperature before removing from pan. The cookie cups will stay fresh in an airtight container at room temperature up to 4 days.